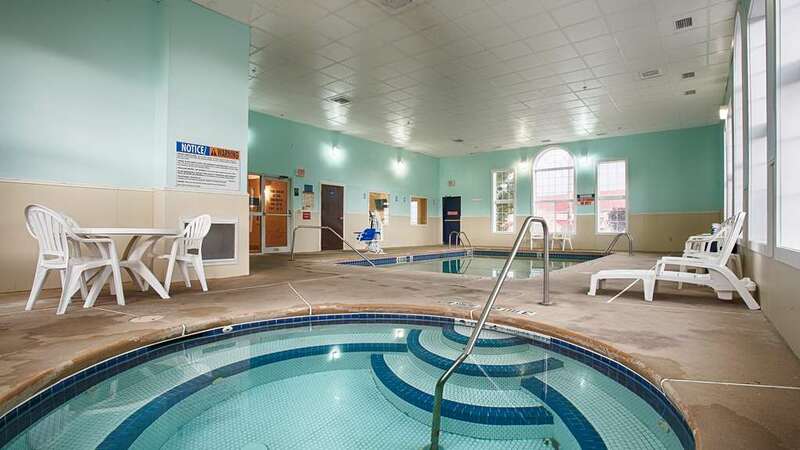 Visit this great hotel in Batavia, New York that is located near Darien Lake Theme Park, Batavia Downs Gaming Facility, Letchworth State Park and State University of New York. Conveniently located right off the I-90, between Rochester and Buffalo in Batavia, New York. This Batavia hotel offers guests convenient access to key area attractions including the Genesee County Fairgrounds, the Jell-O Gallery Museum and the Strong Museum. The Best Western Crown Inn & Suites' affordable guest rooms feature pillow top mattresses, cable satellite television with HBO and free high-speed internet access. Each room has a microwave and refrigerator. A complimentary full hot breakfast is offered daily. Amenities at this New York hotel include a fitness center, heated indoor swimming pool and hot tub, guest laundry and business services. Guests of the Best Western Crown Inn & Suites will be close to a variety of activities including shopping at the Walden Galleria Mall, hiking, golfing, cross country skiing and sledding. This hotel also offers convenient access to the Batavia International Motorsports Park, Darien Lake, the Lancaster Speedway and Niagara Falls State Park. For superior customer service make a reservation at the Best Western Crown Inn & Suites! Enjoy your stay. Center Street Smokehouse: 2.00 mile(s) from Center Street Smokehouse, Bar/Lounge, American, Open for: lunch, dinner, Southern, 5:00 p.m. to 2:00 a.m.
Peking Buffet: 1.00 mile(s) from Peking Buffet, Buffet, Chinese, Open for: lunch, dinner, 11:00 a.m. to 9:00 p.m.
Applebee's: 1.00 mile(s) from Applebee's, Bar/Lounge, American, Open for: lunch, dinner, 11:00 a.m. to 12:00 a.m.
Bob Evans: 0.5 mile(s) from Bob Evans, Bar/Lounge, American, Open for: breakfast, lunch, dinner, Irish, 10:00 a.m. to 2:30 a.m.
Alex's Place: 0.50 mile(s) from Alex's Place, Full Service, American, Open for: lunch, dinner, 11:00 a.m. to 9:00 p.m.
Red Osier: 10.00 mile(s) from Red Osier, Bar/Lounge, Seafood, Open for: lunch, dinner, 11:00 a.m. to 9:00 p.m.
From: East. Follow Interstate 90 West to Exit 48. Proceed straight through toll booth and traffic light. The Best Western Crown Inn & Suites is the third hotel on the right hand side. From: West. Follow Interstate 90 East to Exit 48. After exit, proceed straight through toll booth and traffic light. The Best Western Crown Inn & Suites is the third hotel on the right hand side.